After I had purchased my dress, I started to think about the veil. I wanted to do something really special for the veil, I wanted to have a connection to it. I thought about several things - I thought about making my own, about buying one, and about borrowing one from a family member. I ruled out buying one pretty early on. I wanted something more special, more connected to the women of my family (both my family and my soon-to-be family). I thought about this, and did pretty extensive research. I even wrote a blog post on the subject that has become pretty popular on this blog (by number of visits). I kept coming back to the idea of borrowing a veil. It felt very special to share this special piece of fabric with someone else. Maybe I was influenced by the fact that all my aunts had worn the same veil. I started by asking my married cousins about their veils. My cousin Zizi sent a picture of hers. I loved the simple ribbon detail and I loved the length. My cousin Bebe actually wore the same veil that her mother (and many of my aunt's had worn). My Aunt Beth brought it over and we took a look. It was a very beautiful, long piece of antique lace. Yet somehow not what I imagined - it was very long. I also talked to my future sister-in-law Annie about her veil. 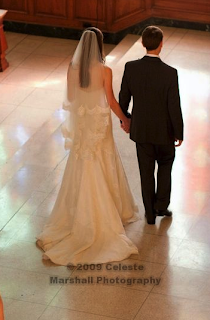 It was a beautiful, cathedral length tulle veil. I loved the simple comb attachment and the soft fabric. During the early stages of searching for the right veil, I didn't know quite what I was looking for. I couldn't picture it yet. Then I stumbled across this photo in a bridal magazine. It was an advertisement for Monique Lhuillier. 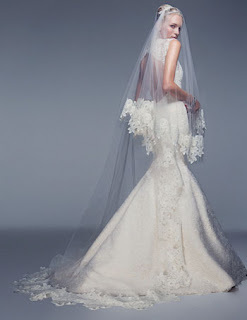 I instantly fell in love with the idea of a fingertip length, lace edged, tulle veil. Around February I had still not figured out what I was going to do about the veil. 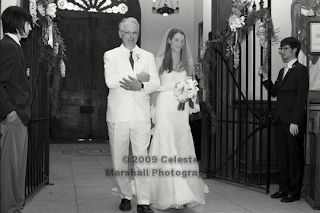 Then sweet Annie offered me the use of her veil and encouraged me to make it my own. I went back to Britex and found the perfect, ivory scalloped French Alencon lace with eyelashes. The pattern was perfect - it looked like it could have been cut from the dress. I took the cathedral length veil to the seamstress at Marina Morrison and they cut it down into a fingertip length veil. I then bought 7 yards of the French lace (really it was 3.5 yards but the lace came two pieces per yard with lace netting in between). The veil was now about 250 inches in circumference. My plan was to hand sew 250 inches of French lace to the edge. As cheesy as it sounds, I was excited to take on this challenge as I would get to spend hours with my mom on the week of the wedding working on it together. 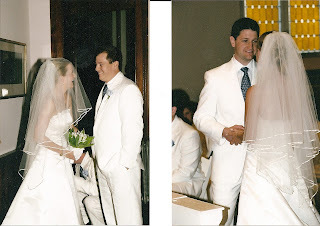 During this time, we would be able to talk about the wedding and get excited together - all while being connected to my new family through the veil. So 250 inches might not sound like a lot, but in the week before the wedding - there were many sleepless nights sewing! Just preparing the lace for sewing, and pinning the lace to the veil took 4 hours! My mom and I each sewed at the rate of about 1 inch every 10 minutes - which works out to almost 40 hours of sewing between us. No kidding - it took a LONG time. After my mom went to bed each night, I watched a lot of Bravo TV to keep the work going. I finished it on Wednesday before the wedding. It was a special time - a chance to slow down while things were winding up. In the end it came out beautifully. It was all that I could of dreamed of - everything I had hoped for and wanted. I got to wear the veil of someone very special to me - my future sister - but also to take the time to create something with my mom (20 hours of togetherness the week of our wedding was pretty special). Our very own sewing circle. A big thank you to both Annie and to my mom - both who were so patient and supportive. Thank you for allowing me the opportunity to wear something connecting me to both families on such a special day.